Pat Sherron hurled a complete game 2-hitter as Rush-Henrietta downed Churchville-Chili, 3-0. Eastridge exploded for 15 runs in the last four innings in a season-opening victory. Senior Shane Harisis led the offensive surge, going 3-for-4 with a walk, five RBI and three runs scored. Senior shortstop Jayden Fayad was 2-for-3 with a pair of walks, two RBI and four runs scored. Avery Bowens, Austin Robinson, Tyler Rogers and Jacob Russo all collected a hit and drove in a run. Sophomore Keenan Calenzo had a walk and an RBI in three at-bats. The Eastridge Lancers scored in five of their six innings. In the third inning, the Lancers sent nine men to the plate and scored five runs without collecting a hit. McQuaid won its second straight game shutting down Corning (IV), who had exploded for 21 runs in five innings on Wednesday against Hornell. Ryan O’Mara pitched a complete game shutout, allowing three hits, one walk and striking out seven batters on 72 pitches. The Niagara University commit had two stretches in which he retired six consecutive batters. O’Mara collected a pair of hits for the second straight game and is 4-for-7 at the dish this season. Charlie Merkley went 2-for-3 with a run scored. Drew Bailey, Ben Beauchamp and Noah Campanelli all had a hit and an RBI. The McQuaid Jesuit Knights have not allowed a run in 12 consecutive innings. For Corning, Noah Walker had one of the team’s three hits in the game. 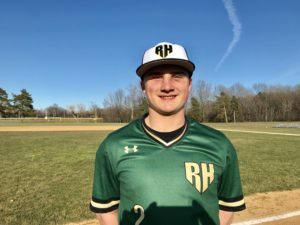 Patrick Sherron hurled a complete game shutout as Rush-Henrietta won its season opener. The senior, who was the starting quarterback on the football team and a guard on the basketball team, allowed a pair of hits, a walk and struck out six batters on 91 pitches. Sherron retired the first seven hitters he faced. Andrew Sanchez went 3-for-3 with a double, a triple, a two-run homer and a pair of runs scored to lead the offense. Cliff Genge, Chris Sleeper and Daniel Tirabassi all had a hit. DJ White had a stolen base. The Rush-Henrietta Royal Comets had five of their six hits go for extra bases. For Churchville-Chili, Wesley Colucci and Amaury Samalot had the team’s only hits of the game. Pitcher Ethan Putney threw six innings of three-run ball, allowed five hits, three walks and struck out seven hitters. Jadon Masucci pitched 4 2/3 innings of scoreless relief to gain the win on the mound for Webster Thomas. Masucci struck out four batters and gave up two hits. Hilton scored one run in the first inning on back-to-back hits by Drew HerrNeckar and Collin Nelson. In the bottom of the second, Matt Stuewe had a hit to lead things off. Mitchell Kelly added a two-run double and Jim Marasco chipped in with a sacrifice fly to give the Webster Thomas Titans a 3-1 lead. In the top of the third inning, Masucci came in with the bases loaded and one out and got out of the jam with a strikeout and fly out. In the fifth, the Titans tacked on 2 more runs as Jake Canfield had a sac fly for one RBI. Stuewe was 2-for-3. Kelly went 1-for-3 and Marasco was 1-for-2. Gavin Moore and Collin Nelson each had two hits for Hilton.